I have quite a few but I want to share one I got at work the other day - actually twice that day. 2 different people, one in the morning and one towards the end of the day said to me, "Do you know you're so beautiful without makeup? You really don't need it." It made me feel really nice, I cannot lie. And even though I don't quite agree (I need makeup IMO) it made me feel good that some people out there think I'm fine the way I am. Ah! I am such a sucker for kind words, I enjoy giving and receiving compliments. Someone recently told me that a dress that I sewed didn't look handmade. I was so pleased. That is a DIY sewer's best compliment ever. You have lovely skin, so you'll have that beauty glow with or without make-up. Lucky girl ! Ugh, backhanded compliments are the worst. There's really no point to them. Awww, I can imagine how you felt getting that compliment about the dress! Yay you! 1. You have a very nice dentition. It was from a guy that was not interested in me in anyway. It was really nice to hear, because I had never thought about it. 2. 'Are you a model?' No. 'You've got a really nice body. This meant a lot because it came from a very old white lady I saw on the road. Those two come to mind right now. I like compliments like the first one that make you pause and think about something you never noticed about yourself before. Your hair is nice - really lovely! When all I did was wash it, condition and apply a little bit of eco styling gel. Makes me think of all the money that has gone into brazillian weaves and wigs. 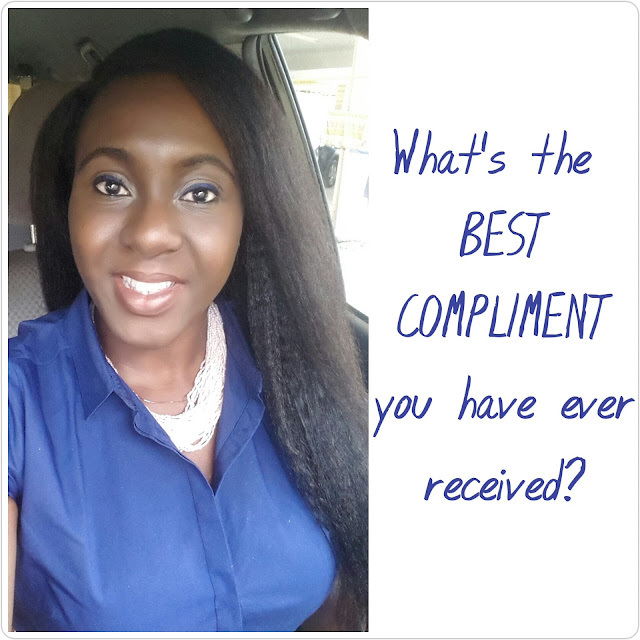 These days, my little or no effort produces so many compliments compared to the huge efforts that went into making my hair a couple of years ago which cannot compare to the compliments I receive these days.... *sigh* LOL!! Sometimes less is more, isn't it? Simplicity tends to catch the eye in a different way. My best compliment ever is from a friend of mine who said to me "your mind is the best thing I know".